Having the ability to communicate through good writing can land you on a lot of freelance jobs. Alternatively, it can also be used to show people how to improve on their writing skills. Don’t fancy teaching? That’s okay because you can still do the same thing through the Grammarly affiliate program. In today’s review, we are going to find out what this tool is all about and how it can be leveraged to boost your online income. Created in 2009, Grammarly is basically an English language writing software that uses unique algorithms to proofread, correct spelling and grammar errors as well as checking for plagiarism of a content. It’s widely used in the education field for students to achieve better grades in English writing and in the business sectors for people to accelerate in their careers. Once the program is activated on the user’s PC or mobile devices, it will scan the work as one type an email, write an article or create a social post. Corrections are notified on the fly using the aid of extensions to prompt changes so that users can publish a good quality content/text online, so to speak. The free version only comes with grammar, spelling, and punctuation errors check. On the other hand, the paid version can do much more like detecting unclear sentence structure, ineffective vocabulary, inappropriate tone and so forth. Depending on the choice of subscription, the costs would range between $11 to $30 per month. A tool like Grammarly is very relevant in today’s settings because we as a modern society, has become heavily dependant on digital communication, whether it’s peer messaging or business writing. Thanks to the internet, the distance amongst us have also shortened and this leads to new phenomena that we’ve have never witnessed before in the past century. People are typing faster and making more typo without realizing it. Students use their computers all the time for writing academic papers and essays. The accessibility to the internet provides more opportunity for people to learn English as their second language. At any given time of the day, one person needs to juggle with his/her communication chores – texting, follow-up emails, writing articles and doing all these in the shortest amount of time. The internet gets thousand of queries from people all over when it comes to fixing their English language problems. 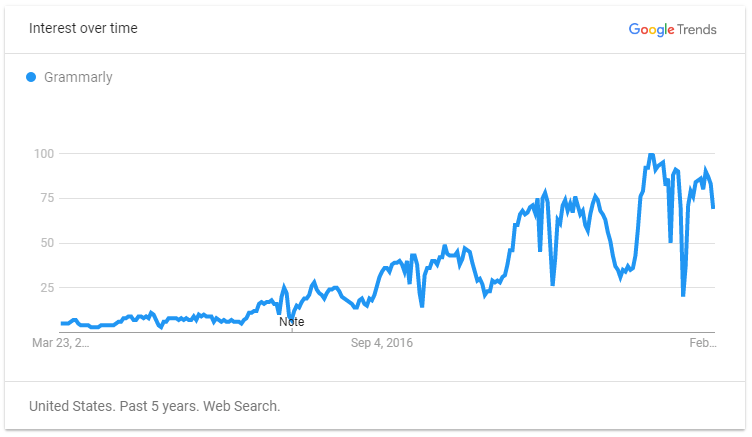 Based on the findings from the Jaaxy Keyword Tool, the term “how to improve English writing skills” gets searched an average of 267 times and “how to improve English grammar”, almost twice as much per month. Clearly, these are profound problems that need solutions and as an innovative online tool, Grammarly can fix most, if not all, the language difficulties that we so often overlook or lack in proficiency. It’s almost like having an English teacher by your side all the time without being too invasive. Furthermore, the pattern at Google Trend suggests that the program is gaining tremendous popularity around the world. This could mean more exposure for the product, attracting more interest from the public and, very likely, getting more customers too. 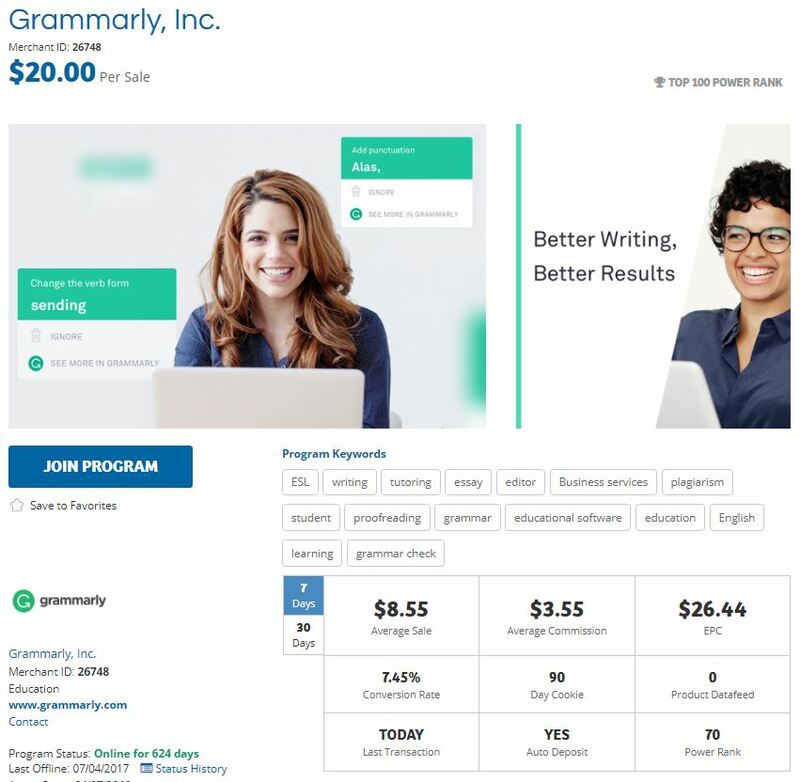 The high sales converting Grammarly affiliate program is managed by two different affiliate networks. Inside ShareASale, they are currently ranked in the top 100 merchant and has been around since 2010. At Conversant (previously known as Commission Junction), they have a network earning of ⅘ which also makes them a good performing advertiser. As an affiliate, you’re given a generous 90 day cookie window and numerous banners to run your promotion. In terms of commission, you can expect to earn 20 cents per free registration and up to $20 per premium account upgrade. Performance-based bonuses are also available if you can generate high volume of sales per month. Anyone can apply for the program as long as they have personally used and benefited from the Grammarly features in their line of work. So people like freelance writers, educators, language teachers, bloggers and even students have the opportunities to make money from this program. The concept is a pretty straightforward one. If you are an English teacher, you can show how the tool helps to improve one’s command of the language and if you are a blogger, you can show how the tool helps in writing good quality articles. The prerequisite however, is that you’d need a website that serves relevant content to the promotion of Grammarly. If your site is heavy with advertisement, uses software to manipulate traffic or have been inactive for a long period of time, you would be disqualified. The company wants affiliates that can offer value and that means, having a targeted audience in mind and knowing how to use Grammarly to solve their everyday writing problem. This is the same as knowing what type of key phrases that could exist within a group when they search on Google. For example, if you are an English language teacher, using these keywords to create your content would be relevant. If you are a blogger helping another blogger, then using these keywords would make more sense. So even though Grammarly is like the ‘Swiss Army knife’ for correcting English language, it still has to fit into the context of the readers to create relevance. The more the relevance, the better the value-creation and thus, promoting the tool would feel more natural to you as well as for the readers. If you haven’t got a website yet, I highly recommend using a self-hosted WordPress. It’s easy to customize and able to house a ton of content to help you get good rankings on the search engines. Simply create one for free using the app below. While analyzing the tool as a whole, it’s worth taking note of other competitors who also provide similar features as Grammarly. Side-by-side comparison is a great way to write a product review – it’s more comprehensive and offers readers clear choices on what they can and cannot benefit from. In fact, some of these tools come with affiliate programs too, so if a reader decided to purchase the alternative, you’d still get commissioned nevertheless. Pro Writing Aid – 50% sales commission, 90 cookie window, in-house application. Ginger Software – $20 per sale, 90 day cookie, via ShareASale. White Smoke – $20 per sale, 30 day cookie, via ShareASale. The world has more than 7 billion people communicating through the internet on a daily basis and with globalization, anyone can benefit from using online grammar tools to write better English. If you haven’t tried Grammarly, now is the chance to do so and see how it fits into your field of work. If you are already an experienced user, joining the Grammarly affiliate program is a great way to help others and make some extra cash along the way. I hope this quick review has been an eye-opener for you. For more tips and training about becoming a successful affiliate marketer, please check out my recommended training platform here. Great review! I’ve heard of Grammarly before but never realized how useful it was. This is something I wished was invented when I was a student years ago, struggling with typing my dissertation! How times have evolved. I didn’t know there was an affiliate program for this product so thank you for bringing this to my attention. The incentives are quite generous. However, you mention that your website needs to be relevant to be able to promote it. I’m an alternative health blogger. Do you think I am a suitable candidate? Hi Teresa. I guess it depends on what you want to promote. If you are showing people how they can get started with a health blog writing good content, just like what you did, then suggesting this tool as an affiliate is absolutely relevant in my opinion. Go ahead and apply anyway. If they don’t approve of you, ask them why and work around that. As a freelance writer, I have been using the Grammarly app for browsers for about 2 years now. I must say this tool is awesome as it has made my life much easier. With this basic version, I can proofread a 2,000-word article in 15 minutes, depending on network speed. Another great feature is that it has a plagiarism checker for the premium version. As content writers, we need this type of filtering to ensure our work is both error-free and copycat-free. I wasn’t aware of their affiliate program though. I may take on your keyword ideas, create some interesting blog posts with them and apply for the program right away. Thanks for the awesome tips! This writing software is very helpful for someone like me. Ever since starting a blog, I have been trying hard to improve on my English grammar and even engage with a private teacher to show me how to better express myself in writing. I will definitely give it a try and join the affiliate program if I get the chance. I have been using Grammarly for a while now and absolutely love it. I love that it picks up both grammar errors and spelling errors and gives you alternatives to use. I always check all my writing using this tool. The best thing is that it is free. I haven’t upgraded yet as I feel that it does the job pretty well on the free version. I would love to hear from someone who has upgraded to see if this is a worthwhile thing to pursue and may consider becoming their affiliate if I see enough value in it. I’ve personally used this program in the past and found it to be useful in checking grammar mistakes on my blog posts. The commission is much better than I thought and I am astonish by the online trend. The only downside for me personally is that the affiliate program is run through ShareASale which I have bad experiences with in the past ventures. But that may have been down to me as much as them, who knows.